Leaders in geriatrics have argued for national- and community-level policy change to create an environment conducive to ACP.6In order to improve the environment for ACP, however, it is essential to understand the current obstacles. To that end, the Washtenaw Health Initiative (WHI), a volunteer collaborative in Washtenaw County, Michigan, examined community barriers and their relationship to nationally identified barriers. In early 2016, the WHI conducted a series of focus groups and interviews with over 80 Washtenaw County community members and physicians to understand the community’s experiences and challenges with ACP. This brief summarizes key findings and policy recommendations related to challenges to ACP, based on the focus groups and interviews and a review of relevant literature. While older adults and individuals with a serious illness are more likely to engage in ACP, these conversations can (and should) occur in virtually every stage of adulthood. In early adulthood, ACP conversations may involve broader discussions, such as how one’s personal or spiritual values would influence treatment preferences and identifying potential patient advocates or surrogates; older adults may focus on concrete discussions about whether a person wants life support or other such treatments if he/she was in a coma. Concerns about preferences not being honored. Participants associated ACP with dying, not with making choices about medical care. They felt challenged by ACP because they could not predict all the potential circumstances they might face. Some participants assumed their family knew their wishes and did not see a need for an AD. Participants also expressed concerns that documenting preferences would limit their treatment options or encourage their physician to “give up” on curative treatment. African-American participants cited general mistrust of the healthcare system as a major barrier to ACP. Participants also had concerns about how they would update their AD if their preferences changed; many believed that they needed an attorney to complete or update an AD. Others, particularly in the veterans’ focus group, feared that even with an AD, health practitioners would not honor their preferences, while rural community residents worried that their ADs might not be accessible when needed. Figure 1. Accessibility and utility of ADs. Physicians who felt uncomfortable with ACP reported that they did not have the necessary training to begin the conversation. They found it difficult to settle on a course of action when faced with differences of opinion among the patient and family members, or among multiple practitioners. Physicians were also concerned about documentation of patient preferences. Some found that even though ADs are a vehicle for recording ACP conversations, they are not useful clinically because the AD often does not address specific conditions or circumstances a patient may experience. Ideally, physicians felt that ACP was an iterative process with the patient and family in the outpatient setting about values, goals and wishes, rather than trying to determine preferences for a myriad of detailed scenarios. However, even when given the opportunity in the outpatient setting, many physicians felt it was difficult to find the right words to say to initiate ACP conversations, especially when the patient was not ready, did not understand their illness, or did not have a family support system. Figure 2. Health systems should train clinicians about how and when to begin ACP conversations (e.g., what words to use) through informational materials or video tutorials. Medical schools should invest in training all physicians how to have ACP conversations with patients, not just those specializing in geriatrics or hospice and palliative care. Federal efforts to encourage the interoperability of EHRs, or the ability to exchange EHRs and share information, should make ADs readily available and should work with online registries such as MyDirectives, a private service, or Michigan Peace of Mind, a state AD registry. 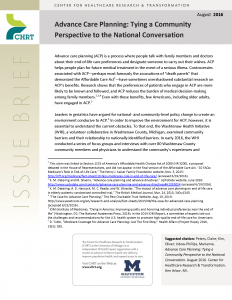 Findings from the literature and Washtenaw County focus groups highlight the complexity of ACP and the barriers to broaching these conversations, but also ways to improve and increase them. While participants acknowledged the challenges—and their own personal fears—regarding end-of-life care, they realized the importance of making their preferences known. By understanding these community-level challenges and recommendations, local leaders can increase the number and improve the quality of conversations about health care choices. Community participants were men and women aged 40 and older who reside in Washtenaw County. Participants did not need to have completed an AD to participate. Physician participants specialized in internal medicine, family medicine, geriatrics, oncology, palliative care, pulmonology, neurology, transplant hepatology, and hospital medicine. Participants in the outpatient physician interviews specialized in family medicine, geriatrics, hospice and palliative care, and internal medicine. This claim was linked to Section 1233 of America’s Affordable Health Choices Act of 2009 (HR 3200), a proposal debated in the House of Representatives, and did not appear in the final version of the Affordable Care Act. “10 FAQs: Medicare’s Role in End-of-Life Care,” The Henry J. Kaiser Family Foundation website, Nov. 5, 2015: http://kff.org/medicare/fact-sheet/10-faqs-medicares-role-in-end-of-life-care/ (accessed 6/19/2016). K. M. Detering and M. Silveira, “Advance care planning and advance directives,” UpToDate website, June 2016: http://www.uptodate.com/contents/advance-care-planning-and-advance-directives#H2095034 (accessed 6/19/2016). K. M. Detering, A. D. Hancock, M. C. Reade, and W. Silvester, “The impact of advance care planning on end of life care in elderly patients: randomised controlled trial,” The British Medical Journal, Mar. 24, 2010, 340:c1345. “The Case for Advance Care Planning,” The Pew Charitable Trust Website, Aug. 19, 2015: http://www.pewtrusts.org/en/research-and-analysis/fact-sheets/2015/08/the-case-for-advanced-care-planning (accessed 6/22/2016). IOM (Institute of Medicine), “Dying in America: Improving quality and honoring individual preferences near the end of life” (Washington, DC: The National Academies Press, 2014); In the 2014 IOM Report, a committee of experts laid out the challenges and recommendations for the U.S. health system to promote high-quality end-of-life care for Americans. D.Tuller, “Medicare Coverage For Advance Care Planning: Just The First Step,” Health Affairs (Project Hope), 2016, 35(3): 390. Living wills are not legally recognized in Michigan. For more information, visit: http://www.legislature.mi.gov/documents/Publications/PeaceofMind.pdf. For more information about Five Wishes, visit https://www.agingwithdignity.org/five-wishes/about-five-wishes. Most states consider an out-of-state advance directive valid if it was valid in the state it was created. For more information, visit: http://www.americanbar.org/content/dam/aba/uncategorized/GAO/2013sep16_hhs_testimony.authcheckdam.pdf. D. C. Mooney and J. G. O’Gorman, “Construct Validity of the Revised Collett-Lester Fear of Death and Dying Scale,” OMEGA-Journal of Death and Dying, Sept. 2001, 43(2), 157–173. J. Jong, “Why contemplating death changes how you think,” The BBC Website, Feb. 9, 2016: http://www.bbc.com/future/story/20160208-why-contemplating-death-changes-how-you-think (accessed 6/19/2016). “Kaiser Health Tracking Poll: September 2015,” The Henry J. Kaiser Family Foundation website, Sept. 30, 2015: http://kff.org/health-costs/poll-finding/kaiser-health-tracking-poll-september-2015/ (accessed 6/19/2016). “Advance Directives and Advance Care Planning: Report to Congress,” U. S. Department of Health and Human Services, Office of the Assistant Secretary for Planning and Evaluation, August 2008: https://aspe.hhs.gov/sites/default/files/pdf/75811/ADCongRpt.pdf (accessed 6/19/2016). Dying in America—2014 IOM Report. H. Malcomson and S. Bisbee, “Perspectives of healthy elders on advance care planning,” Journal of the American Academy of Nurse Practitioners, 2009, 21(1): 18–23. K. Johnson, M. Kuchibhatla, D. Tanis, J. Tulsky, “Racial Differences in Hospice Revocation to Pursue Aggressive Care,” Archives of Internal Medicine, 2014,168(2):218–224. C. Waters, “Understanding and Supporting African Americans’ Perspectives of End-of-Life Care Planning and Decision Making,” Qualitative Health Research, 2001, 11(3): 385–398. H. Washington, “Medical Apartheid: The Dark History of Medical Experimentation on Black Americans from Colonial Times to the Present” (New York: Anchor, 2007). N. Keating et al., “Physician factors associated with discussions about end-of-life care,” Cancer, Feb. 15, 2010, 116(4): 998–1006. A. D. Vleminck et al., “Barriers and facilitators for general practitioners to engage in advance care planning: A systematic review,” Scandinavian Journal of Primary Health Care, Dec. 2013, 31(4): 215–226. T. Fulmer, “Talking with Patients about End-of-Life Care: New Poll Reveals How Physicians Really Feel,” The John A. Hartford Foundation website, April 14, 2016: http://www.jhartfound.org/blog/talking-with-patients-about-end-of-life-care-new-poll-reveals-how-physicians-really-feel/ (accessed 6/19/2016). S. Snyder, K. Allen, S. Hazelett, and S. Radwany, “Primary Care Physician Knowledge, Utilization, and Attitude Regarding Advance Care Planning, Hospice, and Palliative Care: Much Work Remains,” Journal of Pain and Symptom Management, Jan. 2011, 41(1): 307. S. Alexander, S. Keitz, R. Sloane, “A Controlled Trial of a Short Course to Improve Residents’ Communication With Patients at the End of Life, “Academic Medicine, Nov. 2006, 81(11): 1008–1012. Fulmer, “Talking with Patients about End-of-Life Care. These recommendations include those mentioned during the focus groups and interviews as well as broader policy recommendations. One such example is the Respecting Choices model, which was developed by the Gundersen Health System in LaCrosse, Wisconsin. For more information on Respecting Choices, visit www.gundersenhealth.org/respecting-choices. This recommendation aligns with the 2014 IOM Report recommendation to work with civic leaders, including faith-based organizations, to reach out, raise awareness, and promote ACP in communities. T. Harter, “What Kind Of Advance Care Planning Should CMS Pay For?” Health Affairs Blog, March 19, 2015: http://healthaffairs.org/blog/2015/03/19/what-kind-of-advance-care-planning-should-cms-pay-for/ (accessed 6/19/2016). M. Ross, “Advance Care Planning: Who, What, When, Where, and How,” PYA Healthcare Blog, Jan. 5, 2016: http://healthcareblog.pyapc.com/2016/01/articles/reimbursement/advance-care-planning-who-what-when-where-and-how/ (accessed 6/19/2016). A. Smith, “Questions about Medicare payment for advance care planning,” GeriPal Blog, Sept, 4, 2015: http://www.geripal.org/2015/09/s-about-medicare-payment-for-advance.html. Through the reimbursement system, CMS can disseminate information on what should be included in the conversation to be reimbursable as well as to gather more information about who is billing. Providing additional guidance does not necessarily have to be prescriptive but could establish some best practices on what meaningful ACP should look like for purposes of reimbursement. For more information, visit: http://www.hfma.org/content.aspx?id=47288. U.S. Census Bureau, 2010–2014 American Community Survey 5-Year Estimates, Washtenaw County, Michigan: http://factfinder.census.gov/faces/nav/jsf/pages/index.xhtml.